Lost in the hoo-hah around the new Warriors of Chaos releases is the release of some new 40k terrain. GW are releasing a series of trenchline fortifications. Pictures were there (for the eagle-eyed) in the new Chaos Renegade Codex and there is a spread in the new White Dwarf. Initially it will be released as a "For Limited Time" bundle deal comprising 1 Bunker, 2 Encampments and 3 Defense Lines. However like previous releases you've got to expect individual sets will be released. My understanding is the NZ RRP 240 (Oz RRP 205). This looks a good set but I'm not sure about the price until the full contents of the bundle are laid out. Certainly I think it makes a fine addition to the table but $240 is not small biccies either (USD 180). The other concern is - although it is hard to see in the pictures - that piled up in front of the fortifications are piles of dead Cadians. This makes the terrain very army/theatre specific. 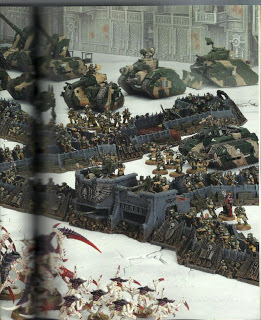 You can - I suppose - treat them as Cadians/traitor guard assaulting/defending the positions but what if you typically play Ork vs. Eldar/ perhaps they are innocent bystanders caught in the crossfire. Seems a strange decision to include them as integral part of the piece.